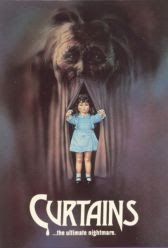 Curtains" can easily be ranked among the ten or fifteen films that define the peak of the slasher era in the early 80's. It, along with films like "Happy Birthday to Me," "Prom Night," "Terror Train," and "The Slumber Party Massacre," to name a few really contain all the components that have come to define the slasher film and introduced us to the cliches that we have come to expect. However, as a whole, "Curtains" doesn't have THAT much going for it. It's pacing is fairly slow, the plot and acting questionable, and character's wooden. It revolves around famous actress Samantha Sherwood (Samantha Eggar) who has been promised the lead role in respected director Jonathon Stryker's (John Vernon) new film about an eccentric and psychotic woman named Audra To get into her character, Samantha checks into a mental institution, the ultimate in "method acting" as she claims. Little does she know the director plans to leave her there, as he has arranged a casting call at his mansion with six different actresses that he wants to audition for the role. Needless to say, a killer begins offing the actresses one by one. Who is the killer? Well, it doesn't take a rocket science to figure it out, even though the filmmakers want you to be shocked at the revelation. A lot of the film simply doesn't make sense. Why would the director allow Samantha, who escaped from the institution, to just show up at the mansion and intimidate the other girls? If the role of Audra is so important and coveted, why try to audition a bunch of no-name actresses who work in taverns and drive Pintos? Why would the killer even for one minute think that offing the competition would assure her the role? the film really drags in parts, which is it's main downfall. We also don't get to know the characters, so could really careless whether they live or die. I suspect some of these plot holes have to do with the now known plethora of problems that plagued the filming of Curtains, including recasting and forced reshoots. In fact, it took almost three years for this film to even be released. My suspicion is that at a certain point, the director and actors involved just wanted to be done with the production and settled on this cut of the film. Despite the flaws, "Curtains" is certaly remembered and cherished for its tense atmosphere and downright creepy sequences. The ice-skating scene is amazing and will give you chills to this day; one of the actresses decides to go for a morning ice-skate, only to find a creepy doll buried in the snow. As she looks up from pulling the doll from the snow, she sees the killer, masked with an UGLY and frightening hag mask, coming at her with a sickle. The scene is filmed in slow motion, which adds to the creepiness of it. Once seen, it is hard to forget and really remains a staple scene from an 80's slasher flick. Though no other scene in the films tops that one, the climax scene in the creepy basement also is an exercise in developing a creepy, claustrophobic atmosphere. These scenes alone raise the grade of the film and make it more memorable than others of the same era. If only the director could have injected the film with more of these scenes, Curtains could have rose above its short-comings. Still, it's not a bad film, and I don't want to give the impression that it is. It just could have been SO much better. 1983 seems like ages ago, though I still remember my first viewing of "Curtains" fondly. With a new generation of horror/slasher flick lovers being bred, I encourage younger fans of the genre to seek out the early 80's slasher flicks. The old cliché "they just don't make 'em like the used to" certainly applies and fans will see how these early films influenced the horror flicks of today. Why do you think so many classic slasher flicks are being remade?? "Curtains" remains required viewing for any slasher fan, despite its many flaws. Hopefully, a DVD release will bring it a whole new fanbase and level of respect.